Add another plaintiff, litigate till done. A naturalized citizen — who immigrated to Texas from the United Kingdom and is a registered voter — is joining a Latino civil rights group in suing top Texas officials after her voter registration was flagged by the state for a citizenship check. Signing onto a lawsuit filed by the League of United Latin American Citizens, Atascosa County resident Julie Hilberg on Friday alleged that Texas Secretary of State David Whitley’s move to question the legality of tens of thousands of registered voters in Texas was an unconstitutional, discriminatory burden on the right to vote. 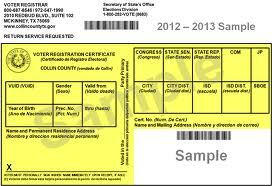 Hilberg — who also joined the League of United Latin American Citizens in its claims that Whitley and Attorney General Ken Paxton have violated a provision of the federal Voting Rights that prohibits the intimidation of voters — added her name to the suit, but she is also seeking to represent all of the legitimately registered voters who appear on the state’s list as a plaintiff class. “The burden imposed by Defendant Whitley’s new voter purge program — both the current list of 95,000 registrants flagged for potential removal and the plan to continue this practice on a monthly basis — imposes a severe and plainly discriminatory burden on naturalized citizens who wish to exercise their right to vote,” the complaint reads. After learning about the citizenship checks in the news, Hilberg on Thursday went to the local elections office with her naturalization certificate in hand to figure out if she was among those voters. Hilberg suspected she would be on the list because she had most recently renewed her driver’s license in 2014 — the year before she took her oath of citizenship at a naturalization ceremony in San Antonio. She had registered to vote in Atascosa County in June 2015, and then voted in several elections from 2016 to 2018. When Atascosa County’s election administrator, Janice Ruple, confirmed Hilberg was on the list they had received from the state, Hilberg assumed any questions about her citizenship status would be resolved in that moment because Ruple knows Hilberg — and her citizenship status — personally, according to the complaint. Instead, “Ms. Ruple was unable or unwilling to give Ms. Hilberg any information or assurances about whether her registration would be in jeopardy because her name was on Defendant Whitley’s list,” the lawsuit reads. See here for the background. I don’t know what difference it makes from a legal standpoint to include a plaintiff who was directly affected, but I presume it can’t hurt. Ms. Hilberg was done wrong, and she deserves redress for it.